My ring finger is modelling Glitter Gal Turbulence, middle finger wears Digital Nails Spectraflair Holographic Topcoat, and index is sitting pretty in Hits Hefesto. Each polish is shown at one coat. All have China Glaze Stone Cold as the black polish beneath, and my photos have been taken in sunlight. Time for sunshine picture spam before I get down to the nitty-gritty! This one was hard to price. This brand is based in Australia, US sellers typically put the polishes at these price points, which doesn't exactly translate from their Australian dollar cost. Also, GG used to come in 9ml bottles, which are now 10ml. There doesn't seem to be any distinction in price between the two. Sadly I have heard rumors of Spectraflair prices skyrocketing, and if that is the case it could force indie brands off the market entirely, or prices will increase. Basically: price current as of this writing. 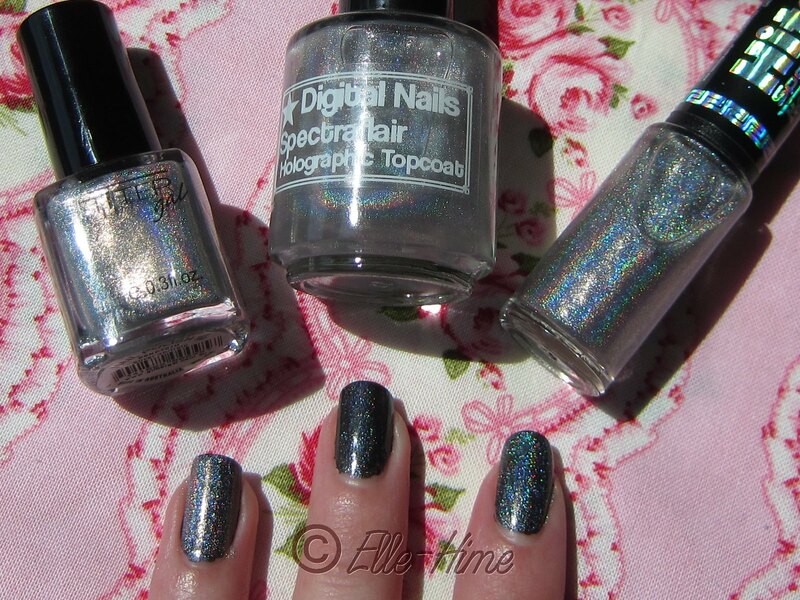 Glitter Gal: Silver/Turbulence wasn't actually intended for layering; it's a straight-up silver holographic polish. Out of these three polishes it has the strongest linear holographic effect in sun or indoors, but makes colors appear very silver. Digital Nails: This is a true linear holo polish, but it's particles are finer than the other topcoats, so it may come off as being more subdued. It's worth noting that it can be built up, however. Hits: Hefesto falls in the middle, but it is still quite strong. It is intended to be used as a topcoat, but it is very silvery and lightens the base color. Glitter Gal: Is the worst offender when it comes to not letting your base color shine through. It greys out the color since it is loaded with strong silver holographic pigment. Digital Nails: Has a very sheer holographic formula, even up to 3 coats the base color stays true. 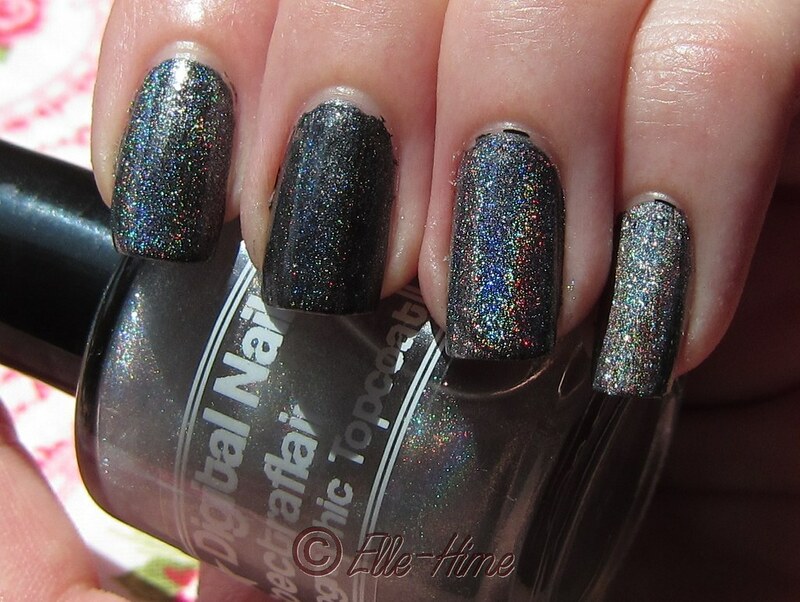 If you want the combination of an exact color and linear rainbows, this is the polish to grab. Hits: Again in the middle, it does cloud the base color to some extent. Glitter Gal: I only have their original mini bottles, but I never had any trouble with the brushes. Also, this brand uses squared bottles, which store nicely! Digital Nails: This is a full sized round bottle with a standard brush. The bottle sits solidly, the brush paints as it is should. Problem free solid performers. Hits: While the skinny bottle looks neat, I fear tipping it over. The brush... is a sad mess. Hits brushes frequently have problems with being fluffy, frayed, and out-of-control. It makes painting your nails tricky. Glitter Gal: This polish has a good formula. Since it is intended to be a silver and not just a topcoat you have carefully apply a thin coat if you want to use it for layering. Their formula is Big-3 free and cruelty free! Digital Nails: This polish has a thicker consistency, hard to describe but it applies perfectly and evenly. Digital Nails polishes are big-3 free. Hits: The polish itself is fine, just hindered in application by the brush. From what I can find the company is cruelty free, but the polishes do contain formaldehyde resin. All the polishes have reasonable wear time and while they have been shown here without topcoat, they play nicely with it. I didn't notice any dulling once everything had dried. Digital Nails Topcoat is my must-have! These are all nice polishes, with my top 2 picks being Glitter Gal Silver and Digital Nails Spectraflair Holographic Topcoat. Hits was in the middle but hurt by the awful brush, the most expensive price tag and not having a big-3 formula. I'd pass on Hefesto. Instead I'd recommend Turbulence for the fact that it is so bold; two polishes in one! Or if you want a true topcoat the prize goes to budget-friendly Digital Nails because it enhances the color beneath, rather than suffocate it. 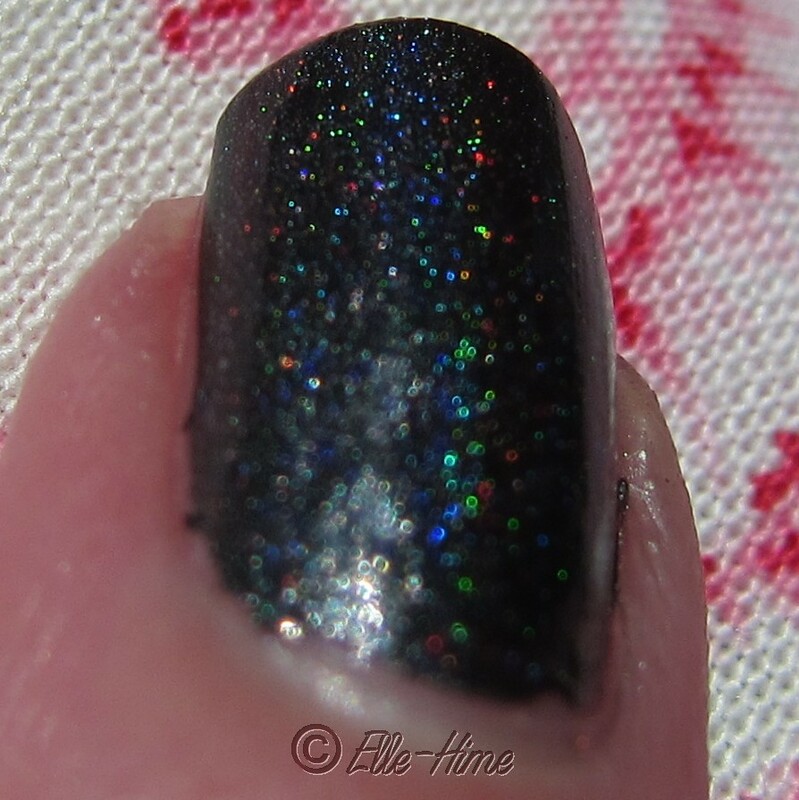 This holds true even when you use multiple coats for a stronger holo effect, as can be seen in my original swatch post. I can have nails that are both *actually black* and *actually spewing rainbows* at the same time! It even manages to stay the cheapest after figuring in using 2-3 coats once in awhile, so that seals the deal for me! I hope you found this comparison helpful, I was curious about these three nail polishes myself and figured someone else must be, too! Different Dimension - Rainbows & Butterflies! Review & How-to: Bow Water Decal Manicure!